In a paper in a recent edition of the journal Proceedings of the National Academy of Sciences,[Gell-Mann and Ruhlen] dispute the assertion by some linguistics that the original human language was organized by Subject-Verb-Object, as English is. Sigh. This creates the impression that there's actual scholarly debate surrounding reconstructing Proto-Human word order. 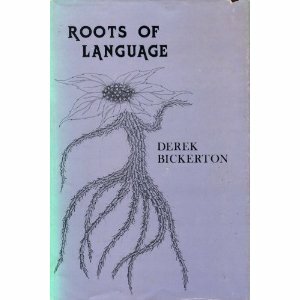 It's true Bickerton made arguments 30 years ago for SVO as the starting point of human language, but it's hardly the core point of the (very controversial) proposal he makes in The Roots of Language. I don't recall offhand that this particular point provoked much discussion at the time. PS: The people who pursue the study of language are called linguists and the field linguistics. Us pseudonymous bloggers make typos but we don't have USA Today's staff to comb for typos. PPS: My personal copy of the book has faded in almost exactly the way shown in the pic here ... the purplish stayed on the jacket where it was protected by books next to it and the spine turned that same weird color with exposure to light. Since when do online photos of books (this one on Amazon) reflect current state of the jacket? A bad week for language in the media.